Monday Night Combat (abbreviated MNC) is a downloadable third-person shooter video game developed by Uber Entertainment and published by Microsoft Games Studios. It was released on August 11, 2010 as part of Microsoft’s 2010 Xbox Live Summer of Arcade. It was released on January 24, 2011 for the PC via Steam. MNC is a class-based third person shooter game in which two teams are pitted against each other in a fictional combat sport similar to tower defense. The competitors on each team are clones, and the goal is to destroy the other team’s Moneyball, a stationary objective which houses the team’s money, while protecting their own. It is presented to the player as the Monday Night sport of the future. The game was well received by critics, averaging 79.37% at GameRankings and 79 out of 100 at Metacritic, two video game aggregate websites. Reviewers were generally universal in praising the quality of the game in comparison to the cost. The game’s graphics and art style were also praised. Critics noted that the six character classes were well suited to the tower defense style of gameplay. As of October 2010, Monday Night Combat has sold over 225,000 copies on Xbox Live Arcade. A few months ago Monday Night Combat came along to Xbox Live and made shooters a joy to play for everyone again. Even twitch averse players don’t face a frustrating uphill battle against horrendously unbalanced uber-players backed up by ridiculous kill streaks, and with support-oriented play at the forefront, it’s not just the shooting that wins the day. Now the awesomeness of MNC has come to Steam, and the PC is a perfect place to play this hybrid shooter, despite its console origins. 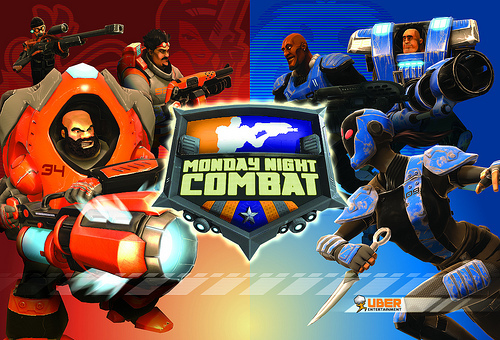 Monday Night Combat has two core gameplay modes: Blitz and Crossfire. In Blitz, which you can play solo or online with up to three other players, you must defend a shiny disco ball full of money from waves of robot attackers. These greedy bots come in many varieties, and each poses a unique threat, from stout soldiers and bounding gorillas to flying suicide bombers and walking mortar cannons. Killing bots earns you money, which allows you to upgrade your soldier’s skills, install defensive turrets at designated locations, and use battlefield hazards to your advantage. Money is also the ultimate tally of your triumph in Blitz mode, and if you successfully defend your money ball, your score gets posted to the online leaderboards. Blitz comes in a few different difficulty levels, and while you can complete the easiest mode by yourself without too much trouble, the tougher ones will strain even experienced teams. Beating these challenges and striving for high scores has some limited appeal, and it’s a good way to familiarize yourself with the four different turret varieties; the various soldier-specific skills; and the sharp, responsive controls. Maybe the only thing better than shooting your friends in the face is getting paid to do so. Monday Night Combat is a third-person, class-based shooter set on a television game show. Players battle bots or other humans in an attempt to destroy the enemy’s Moneyball (which is exactly what it sounds like) and earn cash prizes. There are only two modes — one cooperative and one adversarial — but that keeps the game focused and unique. I don’t know about you, but I don’t really need another Team Deathmatch mode. This is a very lighthearted shooter compared to games like Gears of War or Battlefield: Bad Company and I think it will resonate with people for that very reason. Here, killing people is a motive secondary to protecting your treasure (or destroying your opponent’s).